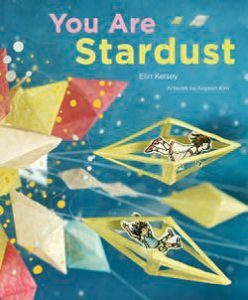 Classroom Connections: You Are Stardust is a gift for any primary teacher who is looking for a way to introduce some big science ideas to young learners. A good fit for earth science topics and environmental themes, this book would also be an effective catalyst for developing connecting, questioning and inferring skills. The illustrations are dioramas that are constructed from a combination of real-life objects, sketches, painting and collaging techniques. Now, doesn’t sharing this book with your class sound like a good idea before setting out the art and craft materials?